As a longtime user of the Kinesis Freestyle ergonomic keyboard, I have often wished that it came with an option for mechanical keys (the awesome benefits of which will be presently explained). At first glance, the Matias Ergo Pro would appear to be the fulfillment of this wish – or the nearest thing to its fulfillment ever likely to materialize. It’s a split keyboard like the Freestyle, with tenting and palm rests roughly analogous to the Freestyle’s VIP3 kit, and it features the excellent Matias mechanical keyswitches. While mechanical keys aren’t the magic bullet of typing, they are the choice of many developers, gamers, and all-around serious typists. This isn’t just because developers and gamers are weird people who live by overkill. Let me explain. Most lower-cost keyboards – including the best-known ergonomic models from Microsoft and Goldtouch – use what’s called a “rubber dome” or “membrane” switch under each key. Picture this as a squishy button you have to smash with the key in order to register a stroke. Mechanical keys work on a completely different principle. Instead of a squishy button to mash, there’s a tiny trigger-like switch on a spring, and that switch is mounted to the side of the traveling key rod, rather than below it. Why is this important? It means you can register a keystroke without bottoming out the key. That eliminates the sudden shock at the end of each stroke, allowing most users to type faster and more comfortably. One big caveat: It’s lusciously tempting to hammer a mechanical keyboard, especially if you are the kind of person who likes to make a lot of noise. But if you succumb to this temptation, the mechanical keys won’t do you any good. A mechanical keyboard actually has no shock absorption at the end of the stroke. Instead, the typist has to be disciplined enough to touch the key lightly. The space itself – the air under the key – is in a sense the shock absorber. Mash the keys down all the way, from stress or delight or whatever, and you’re essentially back to a membrane keyboard. You can bring the two modules of the Ergo Pro as close together as you like for a compact keyboard. 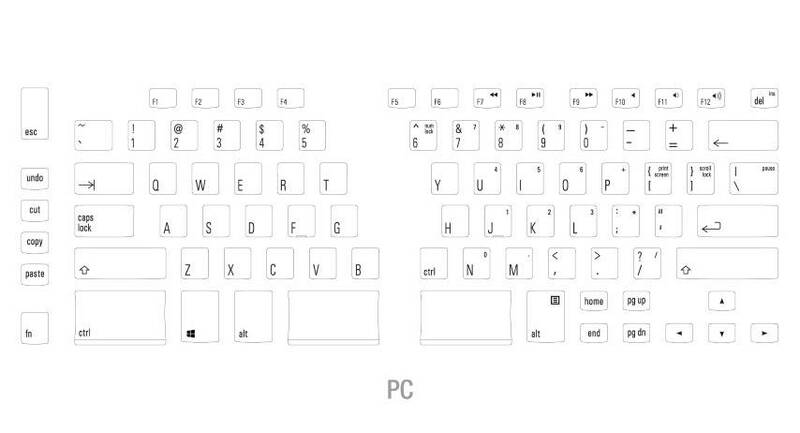 It is quite common for ergonomic keyboards come with their own special, nonstandard key layout. The makers usually claim that this key layout is the best one ever, incorporating everything useful that has been discovered since the invention of the typewriter. Some keep it reasonable, just putting the keys in a grid formation and perhaps moving one or two around. Some go extremely radical, like the Truly Ergonomic keyboard. And some, like the Matias Ergo Pro, try to find a happy medium. Of all the keyboards I have used, the Matias layout reminds me the most of the Kinesis Freestyle keyboard. I don’t have space here to go over the positions of all the keys – you can look up anything you’re interested in on the diagram below – but I will touch on a few high points. 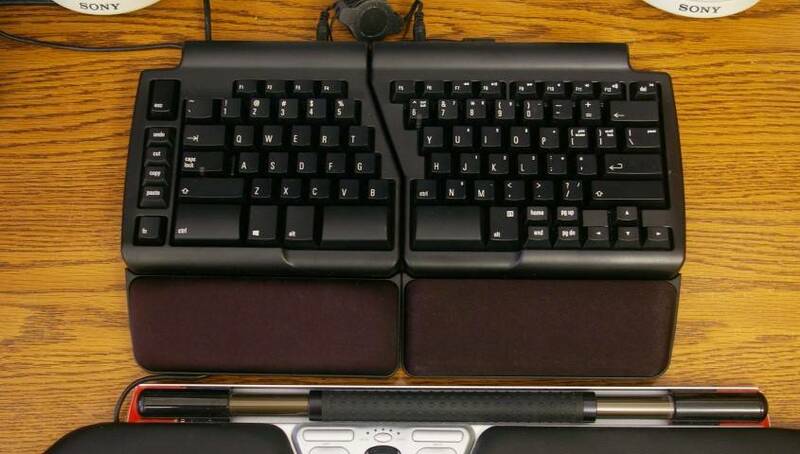 The Matias Ergo Pro key layout (US). Click image for larger view. Small function keys I can live with, but I’m not so excited when the cursor navigation keys get minified as well. Home, End, PgUp, PgDn, and the arrow keys are all half-size – which looks a bit strange next to the mega-jumbo Ctrl keys and spacebar. At the risk of sounding like a socialist, I think the available space could have been distributed a little better. On the plus side, the Ergo Pro does include a left-hand column of useful keys. These include Cut, Copy, Paste, and Undo. I also give the Ergo Pro points for its Fn key implementation, which is momentary rather than toggle. In my opinion, this is the only way that makes any sense. It enables easy access to the media control keys at the upper end of the function row, without having to toggle Fn on and off. Maybe Kinesis would like to take a memo. As I mentioned earlier, the Ergo Pro’s tilt functions are built into its palm rests, each of which has two folding feet along the front. Pop out all four and you get negative tilt for low work surfaces. Pop out just the middle two, together with the corresponding middle feet on the keyboard, and you get 9 degrees of center tilt. Take off the palm rests entirely and you get… well, a flat keyboard. The feet on the keyboard itself are pretty much useless alone. This isn’t exactly a design flaw, but it is something to be aware of: If you don’t like, don’t have room for, or otherwise can’t make use of the palm rests, they’re easy to remove – but then you can’t make use of the tilt features either. This is the Ergo Pro’s negative tilt position. The palm rests are required for negative tilt and center tenting; thus their presence even though I don’t need them with my Contour ArmSupport Red. I cannot properly finish this review without at least a nod to the quality of Matias. Even though the Ergo Pro isn’t a metal tank like some more radical mechanical keyboards, it is very solid without being monstrously heavy. This is a keyboard you could easily tote back and forth to work, using the box itself for a carrying case. (It has a plastic handle for that purpose, and since there are pictures on the box, all your friends will see what an awesome keyboard you have). Transportation is also facilitated by the way the cables are done: All of them detach at both ends, and none are proprietary and difficult to replace. The connecting cable between the two halves, in fact, is nothing more than a TRRS cable like you might use to hook up your phone to some speakers. Speaking of cables, the Ergo Pro also has three handy USB ports where you can get to them – always handy for flash drives and peripherals, whether you’re at the office or on the road.